A spiderweb on her neck. A smiley face on her right middle finger. A "P" on the inside of her right wrist. Three triangles on the inside of her left wrist. An infinity symbol on her right inner forearm. The letters "R.I.P." on her left inner forearm, a few inches above the three triangle tattos. A large cross on her lower back. A smiley face on her left inner ankle. A heart on her left ring finger. Binary Code on left inner forearm (101010) between R.I.P and Bio-hazard symbol. Bio-hazard symbol left inner forearm between binary code and triangles. 6 "stitch" lines between infinity symbol and P on inner right forearm. Simple Cross tattoo on outside of right ankle. Personality: Feisty, confident and perpetually happy, Abby is not your average Goth. Despite being surrounded by the paraphernalia of death, Abby has a happy-go-lucky attitude and a very sweet personality. DiNozzo described her as the "happiest Goth you will ever meet". Death doesn't faze her, though autopsies do. She has a phobia of autopsies ever since she dreamt that she was looking down on her own autopsy. Though she overcame the fear, it returned many years later. Abby's biggest pet peeve, is people who claim to be vegetarians but still eat chicken (though she is not vegetarian herself); her second biggest pet peeve is people who mishandle evidence. She has a gothic style of dress, including black dresses and t-shirts, mini-skirts, and goth jewelry, including anklets and toe rings. She wears her black hair in pigtails and always has a neck choker on, which is one of her favourite pieces of jewelry. She often feels uncomfortable when dressed in "normal" clothes, often referring to them as "monkey suits" and almost had a breakdown when she was forced to dress in business casual in accordance to the NCIS dress codes that new Director Jenny Shepard had approved; she frequently has to be counseled when putting on a suit for court appearances. She listens almost exclusively to Industrial rock and metal which she plays at very loud levels in her lab and gets annoyed if it's abruptly switched off. She also likes to listen to international bands such as Rammstein, as opposed to just English/American bands. Abby also has a stuffed hippo named "Bert" that makes flatulence noises when squeezed, which has been used for comic effect by her colleagues when Abby is upset. She considers him to be her best friend in the lab. 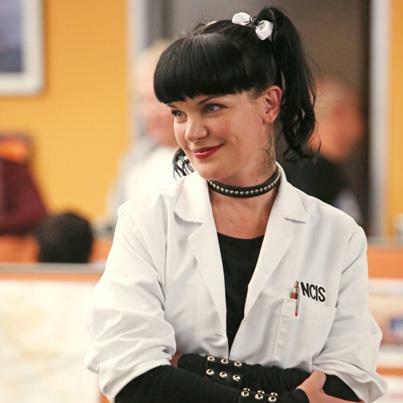 Back at NCIS she decorated some of the areas in her lab with toys such as 'Bleeding Edge Goth' dolls and 'Teddy Scares.' The Teddy Scare 'Rita Mortis' could be seen sitting next to her computer monitor. Like Gibbs, Abby enjoys caffeine, primarily in the form of large cups of "Caf-Pow." At times, when she is worried about the caffeine interfering with her sleep, she drinks "No-Caf-Pow" instead. She is a workaholic and enjoys spending as much time as possible in the lab, which is like a second home to her. She plans on adding some of her dolls and pictures to the Scotland Yard lab to make it feel more homey to her. Her favorite term for something out of the ordinary is "hinky". She enjoys attending concerts and parties when she's not working, but her failure to wear earplugs at one concert left her with temporary hearing loss the next day, forcing her to ask DiNozzo for help analyzing some audio evidence. Abby also has her own custom-made phone with the ring tone being some screeching crows. Abby has a tendency to become very agitated, to the point of near-panic, if any of the team are seriously hurt. When Gibbs was admitted to hospital, Abby ended up on the verge of a nervous breakdown, pacing back and forth while delivering a rambling, disjointed stream-of-consciousness plea that explained (among other things) how close she and Gibbs were, the reason she was arriving after visiting hours, how she felt about Gibbs being injured, and how important it was to her that Gibbs not die from his injuries. Abby loves animals to utter bits, mainly because she finds them to be so pure and innocent unlike humans. In her eyes, an animal can do no harm and it is the owners fault if their pet is aggressive. She chides McGee when he is cruel and outright disliking of Butch, a Navy sniffer dog. When he was sentenced to be euthanised, she locked herself in her lab in protest until she could prove Butch's innocence. Despite her perpetual cheeriness, Abby has dark days where it is hard for her to do anything. Though they are rare, they do happen and Abby hates when they strike because they tend to come unexpectedly. Ever since the bombing attack, she is quieter and more reserved, especially around people she doesn't know. Though she is trying to get back to her old self, it's a long road. On an Abby Energy Scale, she is now around a 7, instead of the average 9 that she used to be. She still gets nightmares about the bombing and during her dark days worries incessantly about her former colleagues and friend, wondering if they are ok. She can also get nervous in new situations because of this, such as moving, starting a new job, and getting along with new colleagues. Skills and Talents: Abby is extremely skilled in processing any and all evidence, physical or digital that is brought to her. She is also talented at hacking with her skills. Excellent at self-defense as proved when her lab assistant tried to kill her, but she got the better of him and hog-tied him with duct tape while she waited for the team to show up. Parents: Gloria and Emanuele Sciuto (adoptive parents). Abby's biological parents are unknown to her. Both adoptive parents are deceased. Siblings: Luca Sciuto (adoptive brother), Kyle Davis (biological brother). Leroy Jethro Gibbs: The leader of the NCIS team that Abby worked on, the two had a close father-daughter type relationship. He is very caring and protective over her, and it has always been clear that out of the team, Abby was always Gibbs's favourite. He was also in the habit of bringing her Caf-Pow's, giving them to her as a reward for good work or as a "bribe", but threatening to take them back if Abby hasn't found enough evidence for him. Caitlin Todd (deceased): Upon joining NCIS, Kate and Abby became close, immediately forming a strong, budding friendship with one another due to the fact that at the time they were the only women on the team. The two girls shared weekend vacations and frequent personal information. They often hung together and regularly mocked and teased Tony much to his dismay, solely due to the fact he always wanted to know what they were doing. By the end they were more like sisters, rather than just friends. Like the others, Abby was left devastated by Kate's death, and as a result was initially cold towards Ziva, whose half-brother, Ari, had been responsible. Dr. Donald Mallard (Ducky): Medical Examiner for NCIS, Abby and Ducky had a fond close relationship with one another. He would often visit her in her lab, bringing her Caf-Pow and the two would chat and listen to music. They would joke, laugh and comfort each other when the need arose. He is also the only person to call her by her full first name Abigail although Abby has expressed dismay at being called that. In a way he is somewhat of a father figure to Abby too, but less so than Gibbs. Timothy McGee: Abby and McGee dated briefly but called it quits. Since then they have remained very good friends and the pair often joked about, sometimes sexually. In some instances, she becomes jealous when McGee projects his attention onto another woman but leaves him be. Ziva David: Although their relationship at first was unstable and frosty, Ziva and Abby soon became close friends. Though she is not as close to her as she was with Kate, the pair get along and are really good friends. History: Abby was born in New Orleans, Louisiana, and raised all over the southern United States. She was adopted by two deaf parents and so learned American Sign Language and how to lip-read while growing up. Due to being a hearing child, she developed a liking for having her music up really loud. Her younger brother and her got along well, despite the fact that they weren't biologically related. Abby grew up having a normal, happy childhood. She learned to drive a manual transmission at age ten and because they lived close to a near a wrecking yard, Abby became being intrigued by the cause and effect of the wrecks which led her to her choice of career in forensics. Abby graduated with full honors from Louisiana State University with a triple major in sociology, criminology and psychology. She earned her master's degree from Georgia State University in criminology and forensic science. She has a PhD in Chemistry and has skills in computer forensics and hacking. After graduation she came to work for NCIS, under Jethro Gibbs. Despite her eccentricities, Abby is a top-class and highly dedicated forensic scientist who has described herself as a perfectionist on more than one occasion. She is almost never fazed by the problems the MCRT throws at her lab, and handles its work almost entirely by herself, often relying on Caf-Pow to help her get through the work although she tends to get very annoyed if her colleagues keep on nagging her. At first, Abby regularly voiced her desire to have an assistant assigned to her lab due to the overwhelming amount of work that was usually given to her, but that never came to pass, possibly due to the fact that it was not in the NCIS budget at the time. However after a change in Director's of NCIS, Abby was assigned an assistant, due to the Director's alarm over Abby's work habits and level of caffeine consumption, although Abby protested at this. Unfortunately, despite attempting to work together, their working relationship did not last long and came to an abrupt and permanent end when Sterling was exposed for trying to frame Anthony DiNozzo for murder, and arrested, having even attempted to kill Abby after his true intentions were finally revealed. But she got the better of him and hog-tied him with duct tape before asking the team if she could work alone now. After that incident, Abby was left to work alone, however she is still suspicious when new people are assigned to her lab. During her time working for NCIS, Abby received many lucrative offers from private firms, but she never left since the NCIS team had become like a family to her. She is loyal and devoted to them and they in turn care strongly for her and are very protective over the woman. At one point Abby was briefly attached to a top-secret government project that was code-named "Tarburst," ostensibly to fill the gap left by the project's chief scientist, Dr. Phillip Heller, who had gone missing under mysterious circumstances. Tarburst's stated goal was to cure Afghanistan War Syndrome, but was later revealed to be aimed at developing biological weapons that could be used to perform assassinations of any kind without even exposing soldiers or other assets to life-threatening or dangerous situations. Upon learning the truth, Abby, furious at how she had been manipulated into creating a biological weapon, eventually quit the project for good and returned to NCIS where she helped the team solve the case, arresting the true criminal responsible. Having grown close to her colleagues, Abby continued to work there for many years. However when NCIS building came under attack from Harper Dearing, Abby was in her lab when the intense explosion. Thanks to Gibbs tackling her, she survived and came out of the ordeal without serious injury. However, due to the attack, Abby's nightmares about being in the morgue which she had originally beaten and which were presumably suppressed for nine or ten years have re-emerged with a vengeance, leaving her psychologically and emotionally traumatized. Not able to continue in the NCIS lab, Abby announced to Gibbs that she was leaving both NCIS and was leaving America. Through some contacts of his, Gibbs was able to secure her a position at Scotland Yard as their lead forensic specialist. With tearful farewells and promises to IM and Skype, Abby left for London to embark on her fresh start. Roleplay Sample: Looking up at the tall silver building of Scotland Yard, Abby swallowed the nervous lump in her throat. It wasn't often she got nervous, but then it wasn't often she started a new job in an entirely new country, either. She longed to take Bert out and cuddle the hippo in order to relax, but he was safely stowed away in the satchel over her shoulder, his grey face sticking out of the side, watching the morning's proceedings. Instead Abby gave Bert a cute smile, patted him lovingly on his head and with a deep breath walked into the building. Green eyes big and round, she looked around her. There was a low hum of activity, like bees working in a hive. Detectives, civilians and scientists rushed about, all too busy in their own world of problems to pay the Goth girl any notice. The thought of whether someone would be coming to meet her to show her around crossed her mind and she stood there for a couple of minutes, waiting. Surely they would have told the department about her arriving. And in her unique style of dress meant that she wouldn't be all that hard to locate. After all, how many Goths worked at Scotland Yard? As the minutes passed and Abby came to the conclusion that no one was coming for her, she wandered up to the receptionist and gave her a smile. "Hi!" she greeted the woman, though her voice came out as a squeak instead of a proper strong greeting. Abby cleared her throat and the smile became one of slight sheepishness for a moment, before reverting back to its normal cheery self. "I'm Abby Sciuto, ex-NCIS," she withdrew her old ID and showed it to the bemused woman, ignoring the twinge of pain that she felt upon remembering her old work. "I'm the new forensic specialist for the homicide department, I've been told. Is there someone who could show me around? Or a map or something? Exceptional as my memory is, kinda hard to get around a place you've never been before...!" Welcome to Scotland Yard, Abigail Sciuto. with one week prior notice.